My kids love ramen noodle soup but I don’t want to serve them super-processed unhealthy foods. My version cooks in one pot in less than ten minutes and hits the spot! Seriously, the kids thank me when I make this one. It’s delicious comfort food and an easy clean-out-the-crisper drawer recipe. Combine ingredients through spaghetti in a large stock pot; bring to a boil and reduce heat to medium-high for eight minutes or until spaghetti is cooked. Meanwhile, dice veggies as necessary. 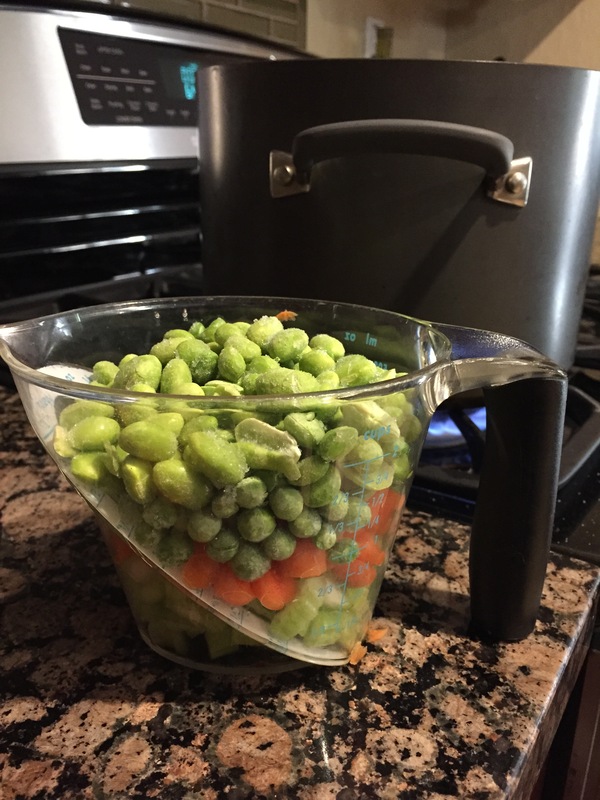 I filled a two-cup measuring cup with carrots, celery, peas and edamame (I stock peas and edamame in the freezer at all times), and set aside a full cup of spinach. When the pasta has cooked through, remove the pot from heat and stir in veggies, lime juice/zest, soy sauce, and sriracha if desired. This recipe can be customized to what’s on and hand and what you like. What veggie goodness do you need to use up? Do you like tofu? Drain/press a container of firm tofu and add it at the beginning. Fresh cilantro leaves make a nice garnish, and you could also use sesame seeds. One of my kids doesn’t like soy sauce so I set soy sauce and sriracha on the table so each diner can season their own bowl. 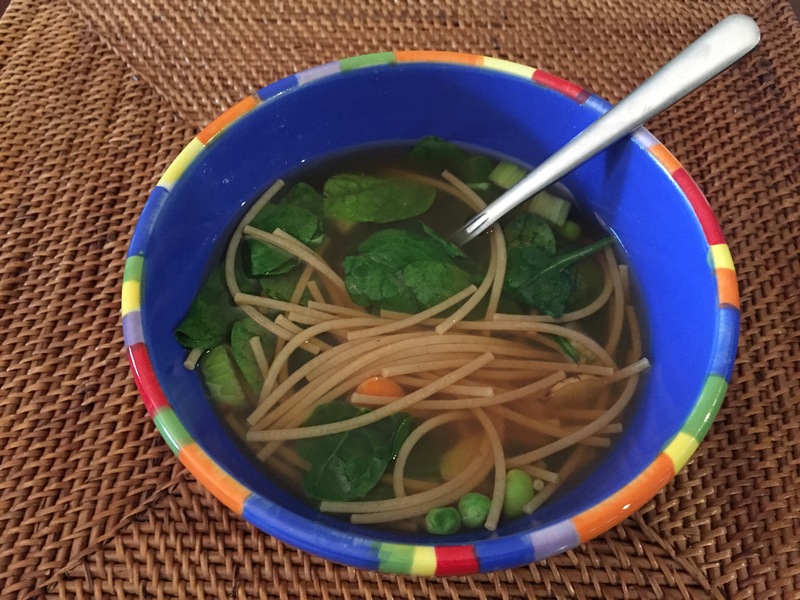 10-minute healthy veggie soup: isn’t that a miracle? This picture has always struck me as an accurate portrayal of my relationship with my mom – the two of us snuggled up, enjoying a book together. Mom read with me all the way through high school, and even when I was in college she sometimes read the books I was assigned. She loves to read, I love to read, and one thing I know for sure I’ve done well as a mom is pass on that passion to my children. I love stories, written stories and life stories. My story and your story. And God’s story, the written version of it found in the Bible, and the living version we play out everyday. I grew up going to church and I knew the kid-versions of Bible stories. But when I got to be a teenager people kept telling me I needed to read the Bible on my own, except I didn’t know how. Let’s be honest, the Bible can be fairly intimidating! It was written in different times and cultures, with different languages and different uses of language (literal, figurative, descriptive, prescriptive, poetic, etc). And that’s even before you get to all the translations (NIV, NLT, NASB), study Bibles or life application Bibles, or even the question of where does one begin to read? At the beginning? At the beginning of the Old or New Testament, or at the beginning of any of its 66 books? And then what? You might feel, as many of us have, like the Bible belongs to certain people, whoever they are, and remains a big mystery to you, that some people ‘get’ the Bible while others aren’t qualified to crack its cover. “Teaching, rebuking, correcting and training in righteousness…” not big words but they don’t easily roll off the tongue. And what do they really mean? God wants to use the Bible to speak to you about what you should know, stop, change, and/or do. So you read this Book, God’s Story, filled with incredible stories of God at work in the lives of some very ordinary people, all the while enjoying a conversation with God Himself about what He wants to say to you through His book. The “know, stop, change, do” paradigm changed everything for me. I didn’t immediately shelve my stack of devotional books. I didn’t stop attending worship or my small group Bible study. But with this simple tool I didn’t have to rely on someone or something to help me understand the Bible. Instead of reading about the Bible I could read the Bible itself and come away changed because I’d read it. Because, while reading, I recognized that I was in the presence of God. Still, where to start? I recommend using a Bible reading plan. I particularly like One Year Bible Online. Click on today’s date and it pulls up today’s Bible reading – Old Testament, New Testament, Psalm and Proverb. I don’t necessarily read all of each day’s readings, but the beauty of a reading plan is I don’t guilt myself if I miss a day or even a few days; I just go to that day’s reading and start fresh. Recently a friend asked me about the Bible. She didn’t understand the basics: Old and New Testaments, the various books of the Bible, the chapter and verse markings. I was so grateful she asked, for two reasons: 1) she trusts me to guide her, and 2) she reminded me that the Church takes for granted that people understand the Book we revere as our authority for life and faith. So to you, dear Readers: if you need help understanding the Bible, find a trusted person to ask your questions; and if you’ve been around the Book a while, don’t assume that others get it. It’s up to us to help them find their way to Jesus, the Living Word. Using this passage, how would you explain the Bible to someone who hasn’t read it? What benefits result from reading Scripture? Put James’ mirror analogy in your own words and explain what it says about Scripture. What does it mean to “look intently” into Scripture and “continue” to do so? Who has been influential in helping you learn to read and apply Scripture to your life? How have they influenced you? What are your practices for hearing the Word? For example, do you have a set time and place to read Scripture? What tools have you found helpful? What do these verses tell you personally to know, stop, change and/or do? Pray that God will actively speak to you through His Word and that the Spirit will guide you to continue in it. Read Bible stories with children, or read a children’s story Bible. My favorite is The Jesus Storybook Bible. Use One Year Bible Online and read for at least five minutes five days this week. As you read, have a conversation with God. What does He want you to know, stop, change and/or do? A couple months ago our church had a women’s retreat. I’m a little funny about gender exclusive events and wasn’t sure I’d go until I opened my mouth to invite others to join me. And then the organizer asked if I would model a sari in the fashion show. Why a fashion show? would be a great question. I can’t say exactly, but it was fun! I considered declining her invitation. I’m not a center-of-attention kinda gal and 170 pairs of eyes on me isn’t comfortable. But that wasn’t my first thought. My first thought had to do with my body, with my discomfort in my own skin, and then with others looking at me. 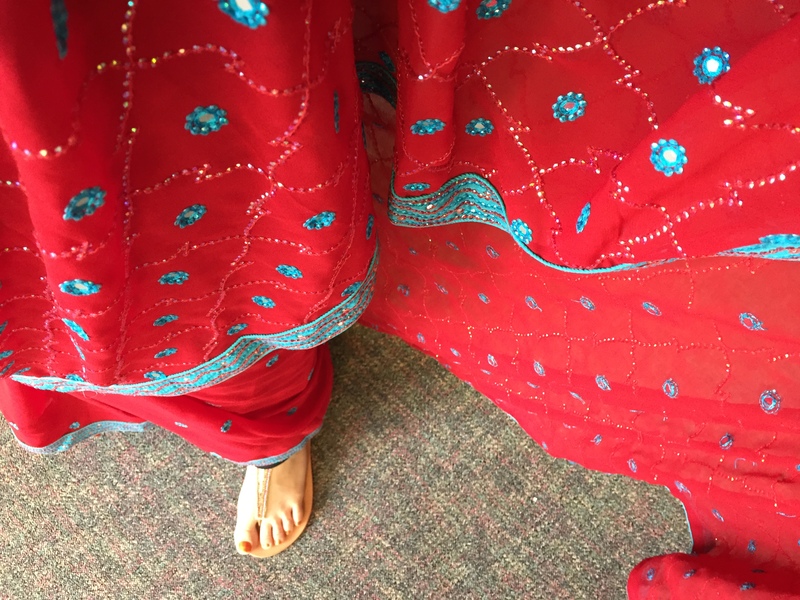 Would the sari fit? Which bulges of flesh might protrude? Saris often bare the midriff and with increasing age I am decreasingly a fan of my midriff. I wrestled with myself and ultimately said yes. My ‘word’ for 2015 is put yourself in the way of beauty. What is more beautiful than a sari, and when would I ever have another opportunity to wear one? I’m so glad I consented! A variety of women, of different ages and appearance, gathered with several Indian women who dressed us and decorated us with stacks of bracelets and jewelry in our hair and on our foreheads. 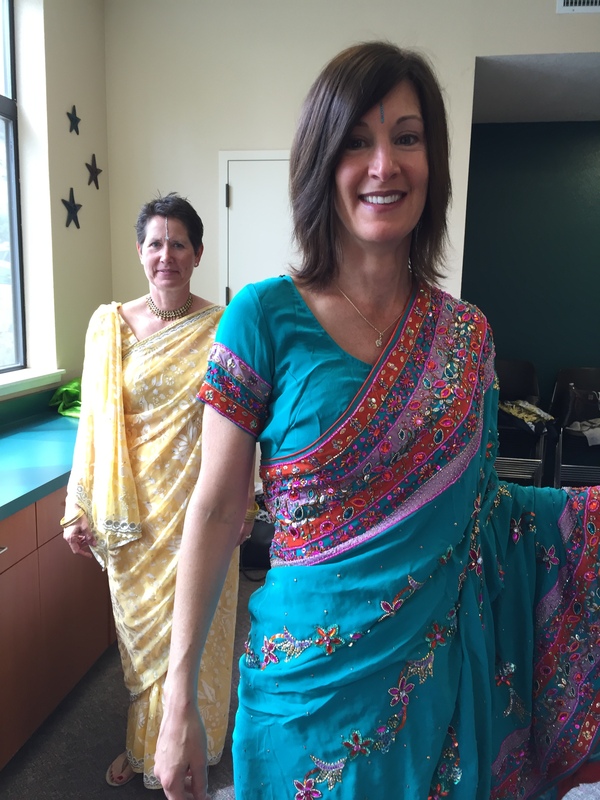 The saris had all been laid out on tables and women gravitated to colors and beading styles. The Indian women estimated which saris would look best on which women, and they expertly pinned and spun us and wrapped and draped us in the nine yards of fabric that are a sari, worn over a petticoat and blouse. We enjoyed the best possible costume party. It was intimate, women dressing women, and special, women making women feel beautiful. We ooh-ed and aah-ed over the gorgeous colors and hand-beaded finery, and over one another wearing the most incredible dresses. 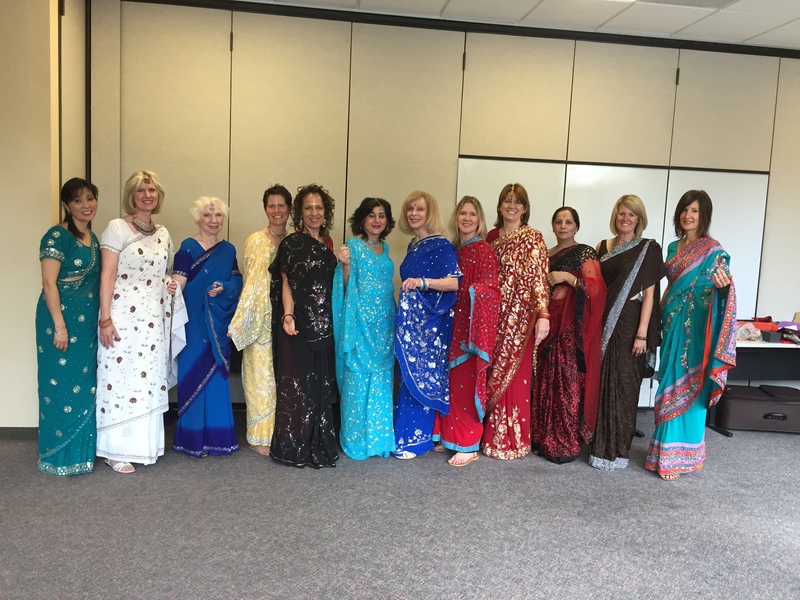 170 women got to see the spectacular saris, but only a few of us got to wear them. And we felt beautiful. The next day I talked with another of the models as we bonded over our shared experience. I told her about my initial hesitancy and her response has been rattling around my head since. She asked, “When have you ever seen a woman wearing a sari past the age of 40-something, who didn’t have a little tummy? Our bodies change with age. But you know, it doesn’t matter. Her husband loves her.” Indian culture respects age and the marriage relationship. They are comfortable in their skin in a way I haven’t been since puberty. I hate the feeling of squeezing into pants/skirts – even if I can hide the squeeze, say, under a loose blouse – that I love and that previously made me feel fantastic. No one feels fantastic when their waistline or bra feels pinched. Ugh! I hate having tried on this and that and *everything* appropriate for the event and just not finding the right thing, even though I have a closet filled with clothes. I hate having to spend money to maintain more than one size of clothes in my closet. I hate the change of seasons as the clothes that just fit are now too hot or cold for the current temperatures. I love that my body supports me in so many important ways, and I hate feeling like I haven’t supported my body in likewise important ways. This morning I felt some amount of shame at having bared my soul about my body, and even more so when I realized how many women I know personally also participate in the group. While drying my hair, I remembered a wise friend encouraging a group of young moms to start each day by saying into the mirror, “Well, hello, Beautiful!” God creates us perfectly, and who are we to say God’s work isn’t beautifully done? So I tried it. It felt funny, and right, uncomfortable because I have an uncomfortable relationship with my body. I eat healthier than most people I know. I try to get regular exercise and I feel great when I do. My doctor says I am healthy. But I’m not athletic or physically energetic and my favorite pass times involve sitting (writing, for example). I don’t look the way I’d like to and with age it becomes more difficult. I don’t want to make excuses, and I need to make peace. And so I continue to wrestle. Guy and I watched a TV show last night that included an attractive woman with an unattractive personality. He commented, “You know, she could really be pretty if she could just act nicely.” Huh. He doesn’t think she’s pretty. We’ve all experienced that to be true – attitude affects your appearance. Dear friend, you have nothing to be embarrassed about, and now nothing to hide or fear or regret; for today we saw your smile and it was wide and beautiful and true and awakened; it was a moment when your soul burst through your worry and it shined for us as an unapologetic glimmer of joy and humanity, a stunning instance of genuine expression… It was a simple thing, those gorgeous corners of your mouth turned up, and perhaps it felt like a daring expression in a world drowning in a pool of pessimism, an unplanned revolt in a time of chaos where all those frowns and furled brows are symbols of disconnection from gratitude and presence and life. But your smile, dear friend, it stirred hope in us. And then you laughed and it seemed a thousand joyous songs leapt into the air and brought the world to its feet. So we ask that you gift us with your smile more often… —Brendon Burchard, Live.Love.Matter. God gave me this particular body along with my particular set of gifts and talents and preferences. I can complain and grumble about the qualities I might wish different. Or I can make a decision to say “Thank you” to my Creator. I can wear a smile, laugh, focus outward, delight in the company of my family and friends, savor good food and wine, and be joyful in my life. Yes! My intention in starting this blog was to chronicle the places and times my eyes caught a glimpse of the Divine among the mundane. So where I have seen God this week? In too many ways to count, actually! Last Monday I led a devotional for a church ministry leadership team. We’ve been reading a book together and this phrase, “living and lingering with the Father who loves me,” grabbed hold of my heart. I could have treated the devo like one more thing on my To Do list and I could have led it as such, but instead I used it to provide an opportunity for us to linger in God’s love. Instead of spending a lot of time discussing a chapter any of us could read I took us to Luke 8, the Parable of the Sower. The thing God impressed upon me from Luke 8 is that the primary difference between the fertile soil and the others is that the good soil not only receives God’s Word but clings to it. I hear a lot of God’s Word, but how do I cling to it? There’s the challenge. So this week I began writing about God’s Word, for myself, as a way of lingering with God in conversation about His Word. There are certainly other ways to cling to God’s Word, but this is working for me. Tuesday I had the opportunity to host a lovely friend for lunch in my backyard. We talked about the challenges of a busy ministry schedule, and that while programs are well and good, Jesus fostered relationships. Relationships require time to ‘waste’ together. She told me some of the ways she has been intentional in relationships with her immediate neighbors and with those in her ‘neighborhood’ – coffee shop and friends of friends, mostly. I am encouraged to look for relational opportunities, to linger. Wednesday the church staff had a great conversation about the need for water, and how new shoots grow from old plants in the right conditions, which led to a discussion about how we can tend to the new shoots who participated in our spring break Mexico house building trip. That afternoon I took Teen on a spontaneous coffee run and saw two teenage girls in the coffee shop, one meeting with an adult from our church and the other who told me she’d met with her team leader the day before. I hadn’t planned to be at that coffee shop at that time, but God allowed me a few extra minutes in order to show me that it doesn’t take a lot of program for relationships to develop – it just takes willing adults ready to foster relationships in His name. Also Wednesday a friend told me about her amazing experience on a two-week trip to Ghana to work at a preschool. She’s well-rounded in mission experience but this trip grabbed her heart differently. How so? Her specific skill set is exactly what the Ghanaian school needs, and she saw just in two weeks the difference she’s already made and a vision for what else she can do. Joy overflowed in her stories. She can’t wait to go back, and those listening can’t wait to hear what happens next – isn’t that a great way to build a support team? Friday Guy and I took a much-needed day to spend together. We went to Napa, just over an hour’s drive from our home, for a wine and chocolate tasting, a Christmas gift experience Guy arranged for me. We talked and laughed, we sipped and enjoyed. We made conversation with the winery employee who served us, and we joined the wine club to continue the experience – and potentially, the relationship with our new friend. We ate lunch outside at one of our favorite spots and we walked around the gourmet marketplace next door. After a stressful few months of too much work and a resulting strained relationship, the day was exactly what we needed. Friday night we hosted friends new and old for a barbecue. Kids and adults, people who’ve known each other for years and others only for a few hours, mixed and mingled and felt welcome. It’s exactly what I want for our home: for people to know they are welcome, to relax and enjoy and be together. Saturday was all about time with Tween and a baseball game where encouragement flew faster than the ball, and today I’ve set aside for Teen and his final rugby match of the season. We’ll have hours together in the car and then I’ll do the thing I do best as Mom, cheering him on from the sidelines. Living and lingering in love – that’s what Jesus modeled, and that’s what I want to be about. Less busy-ness, more love. Yes! I remember the Presidential Youth Fitness tests from my elementary school days. Every year my classmates and I took fitness tests including running, sit ups, push ups, and chin ups. These tests took time away from playing the games we regularly enjoyed, like volley tennis or handball; they were boring; and worst of all, for some of us they were deeply humiliating. I am discouraged to realize that they’re still in use, and that my son has endured the same shame I experienced. The fit kids know they’re fit and the not-so-fit kids know they aren’t – and so does everyone else. You know who’s who, and I’m sure you don’t have to administer the fitness tests to sort kids into categories. The Presidential Youth Fitness Program (PYFP) website tells me their slogan: “Champion fitness. Champion kids.” Great idea, let’s champion fitness among kids! Fitness is crucial to good health and the benefits extend beyond the body, to good attitudes and academics. But the idea that these fitness tests will lead “to youth who are active for life,” not so much. These tests do not motivate. To the contrary, they segregate and provide ammunition for teasing and self-deprecation. Kids are naturally adept at sorting themselves into categories: girls and boys; athletes and artists; hard-working and goofball; smart and, hmm, how about differently gifted? We learn early how to label and where we belong. From the fitness tests, I learned that I am not fit and I don’t fit in and, oh well, I guess I’ll just never be sporty so I won’t bother to try. Sports were not a priority in my childhood home. 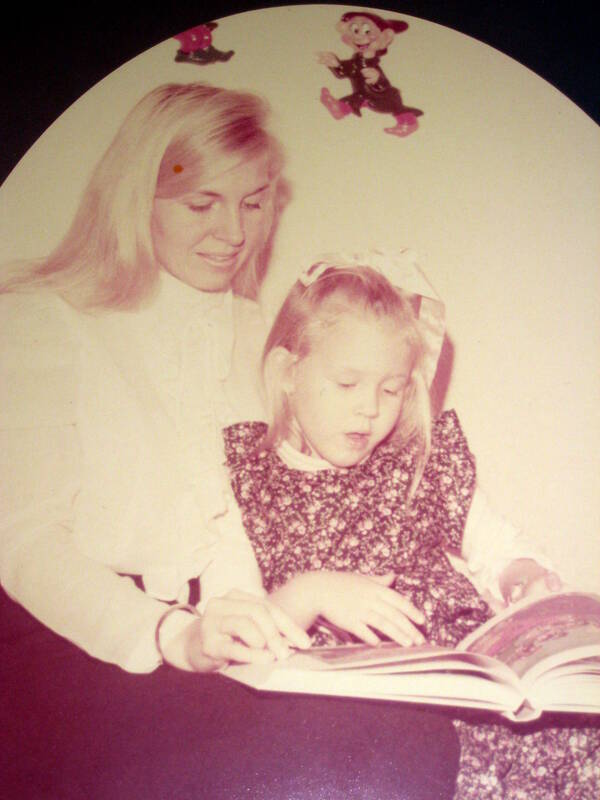 I’ve always been bookish so my family encouraged my strengths and ignored my weaknesses. I tried swimming and tennis but no team sports and nothing long-term. Maybe I would’ve liked some sport, but I didn’t have the right opportunities to try. As I’ve gotten older I have found a healthy activity that works for me, walking/hiking, and I love how I feel when I get regular exercise. That’s the key: exposing kids to the fun of playing and the positive health benefits that result. Kids play naturally; they want to swing and climb and slide and run, so do it! Play sports with them, but also play active games. Make up new games – it levels the playing field because nobody can be already good at a game they’ve never before played. Better yet, get kids involved in making up new games; tap into their creativity and you might engage some otherwise timid players. Measuring kids against an arbitrary “health standard” during a time in life when their bodies are growing at an also arbitrary rate doesn’t motivate. Have you ever noticed the size discrepancies between kids in the same grade? 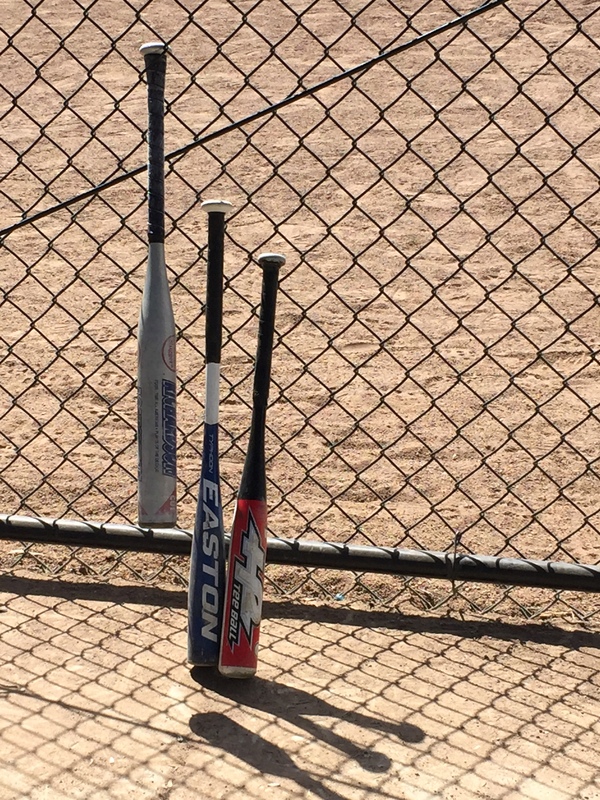 Short and tall, skinny and wide, kids hit growth spurts at different times. Meanwhile their oh-so-fragile sense of self is also developing. Fitness testing made a major dent in my young ego, a dent I still struggle to look past. As a parent, I have offered my kids the opportunity to be involved in recreational sports each season. They play for fun, to learn a game, to develop friendships, and to experience positive life lessons like teamwork and perseverance. Currently Tween plays baseball. Before teams were formed all players and coaches came together to work on basic skills. The coach running the skills day told a story. His dad left their family when he was three years old; his mom did her best to parent three kids, two daughters and a son. But by the time he was seven this kid was, by his own account, “the biggest wuss in the county.” He’d upturn a game of checkers if he lost. So one day his mom pulled their car up to a park, pointed toward a man and said, “There’s your baseball coach. Get out,” and she drove away. Last summer that kid, now a professional youth sports coach running a successful sports clinic, took that coach to five professional baseball games and plans to do the same this summer. That coach instilled good sportsmanship and love for sports into that kid, and he changed the kid’s life. They’re playing new positions and taking risks, running, throwing hard, sweating, and best of all, having a great time together playing a game on a beautiful Saturday afternoon. That matters so much more than how many sit ups my kid can do, or maybe, can’t do. 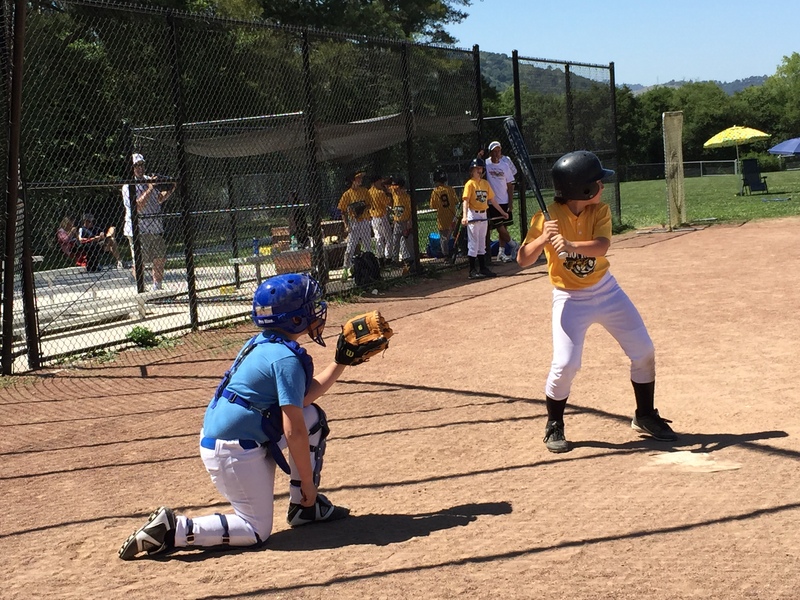 Comic kid sport moment: Tween couldn’t get the catcher’s helmet off without help from his coach – guess one size doesn’t not quite fit all! Like anyone, kids want to do more of what they enjoy and less of what they don’t. So, PE Teacher, by all means, do some sit ups with the kids. Teach them correct technique, and explain the reason to do them. If you can, make it fun. But above all, emphasize play with kids. Teach them to encourage themselves and one another, teach them good sportsmanship, and help them find joy in active play. That will really make you a Champion for kids. You can see her: *that* girl in your high school, the sparkly, witty, smart one, the one everyone adores and some suspect might be way cooler if she wasn’t also the popular kids’ ringleader. Her name might be, for example, Margo Roth Spiegelman. Your high school also had a Quentin, Margo’s next door neighbor, a true Everyman: smart, quirky, has a few smart and quirky friends but mostly avoids the drama of the high school scene. Also, loves Margo. What your high school didn’t have, likely, was a Margo who could go off-the-rails in adventurous/dangerous and almost mean directions. Your Margo didn’t take off unannounced for days at a time. She didn’t leave obscure clues, hoping against hope that her bewildered parents might know her well enough to decipher her vague hints into discernible points on a map. Mystique, thy name is Margo Roth Spiegelman, and there is only one of thee. Paper Towns is fun and meaningful – a high school saga of pranks and prom; social circles crashing, intersecting and bisecting like amoebas in a petri dish; a hero’s quest of a mystery; and a young adult road trip – all mashed up and beautifully written. I really enjoyed this book. I liked the characters – I like high school kids, and I’ve known kids like each and every character Green writes here. I know these adults, too – the well-meaning ones who think too much, the ones with something to prove, and the ones so overwhelmed they give up. Green’s pace moves from fun pranks night to thoughtful pondering to search and rescue; he varies the fast and slow. 1) It took me a while to understand the Paper Towns motif. Green’s obviously thought it through but hasn’t written it clearly enough, especially for a young audience, especially as Margo originally introduces the idea. 2) I don’t think I’ve ever known actual teenagers who think quite as profoundly and philosophically as Margo, and eventually, Q. The poetry, the literary references, the ability to infer and refer so deeply and widely, it’s all fabulous but a tad unbelievable for most 18-year-olds. But then again, we’re not supposed to believe that Margo and Q are average 18-year-olds. “When did we see each other face-to-face? Not until you saw into my cracks and I saw into yours. Before that, we were just looking at ideas of each other…” (p302). Let’s stop being ideas for others, and seeing others as ideas, and start being real people with visible cracks that allow our inner light to shine through. Once again I have allowed a major parenting event to sneak up on me. Teen has had his driver’s permit for the requisite six months and actively practiced driving for the last four months. The license exam was scheduled about two months in advance, and we anticipated that he would pass. So why did it not occur to me until Friday, the day he took and passed the test, that we would soon enter new parenting territory? I sure talked about it enough. One parent would tell me one thing (“Sure, he can drive his brother, just call the police station first”), and another would contradict that with something else (“I don’t know, my friend called the police station and her son still got a ticket for driving his sibling”). By Friday I knew I had to do my own research. By the way, I live in California so the information that follows applies here. If you live in another state, you’ll need to review the information for your state. 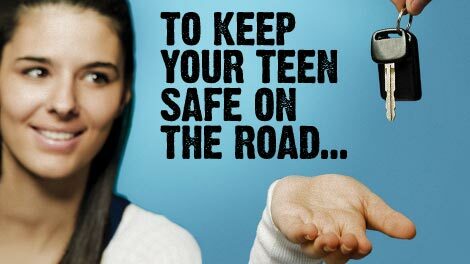 A website all parents of teen drivers should visit: the Center for Disease Control’s page on teen driving. They include graduated driver’s license information by state, “danger zones” for teen driving, and a parent-teen driving contract. The exceptions seem vague, and perhaps intentionally so. However, as I would rather not have to appear in court with Teen to defend an exception, I think we will do our best to avoid exceptions in the first place. He doesn’t have a job, school shouldn’t have him out in the middle of the night, and God keep us from medical emergencies in which he is the most able driver. Another interesting prohibition: under the age of 18, teen drivers cannot use a cell phone in a moving vehicle for any purpose, even with hands-free/bluetooth. Teen plugs his phone into the stereo to listen to music, but changing the song could be cause for a ticket. And a minimum fine of $35 for a first offense, and $50+ for any subsequent offense. If the driver receives three or more points in a 12-month period, a driving suspension for 6 months and probation for one year (although it doesn’t specify what that probation entails…?). On to the contract! When we gave Teen his cell phone we also gave him a cell phone contract that proved more useful than we could have predicted; in fact, after one stressful event he said, “I didn’t know how much I would need these rules!” The rules set the expectations, lay out consequences, and establish an authority we can compassionately refer to when conflict arises. So, even though Guy and I tend to be of the more spontaneous, decide-in-the-moment type, we understand as a family the value of clearly established boundaries, and how much more do we need boundaries on driving than on, say, texting? I urge you to download and discuss this form with your spouse and subsequently with your child (another version here). The CDC has done the hard work; they have thought through all the potential situations for you. As from birth Teen has been riding in car seats, then booster seats, and finally seat belts, I’m not sure he would ever get in a car without buckling up, but he’ll agree to always do so before he gets the keys. Likewise, I can’t imagine he’d ever pick up a hitchhiker, but he’ll agree not to do so before he gets the keys. And while we plan to pay for gas, maintenance, and insurance on our cars (he doesn’t have a car), we will expect that he won’t let the car run out of gas. The form includes a section on restrictions with fill-in-the-blanks so parents can customize for their kids. 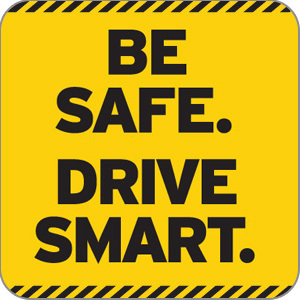 For example we will expect that, for the next three months, Teen will not drive after 10:30pm (we may make exceptions, but this will be the rule). We will cross off the restrictions on transporting passengers (inapplicable in CA), adjusting stereo/air (too rigid), and bad-weather driving (CA in spring/summer? Come on!). Instead of off-limit locations, Teen will have to get destination approval and let us know if he intends to drive somewhere other than originally discussed. And we’ll expect that he not adjust music on his cell phone while the vehicle is in motion; honestly, he can deal with a song he doesn’t like for a few minutes, or else he can use the car stereo. The final section of the form includes penalties. 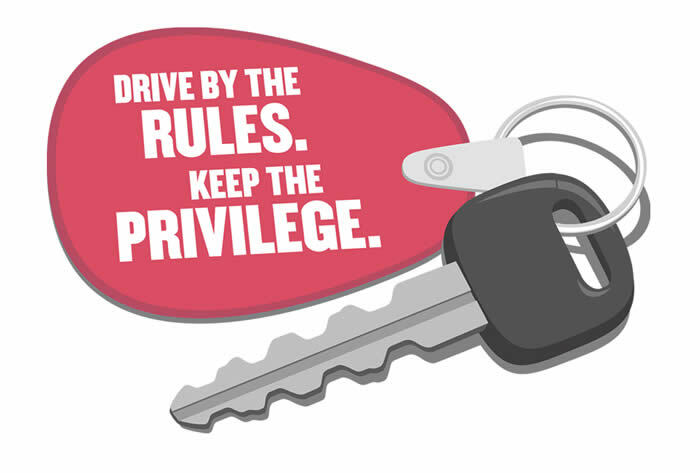 If Teen drives without a seat belt, drives to a not-previously-approved destination, or drives after curfew (aka, arrives home late), he won’t drive for one week. If Teen drives a passenger under age 20, he won’t drive for two weeks. If Teen uses his cell phone in the car or gets a moving violation ticket, he won’t drive for a month. And if he ever drives impaired (God forbid), he won’t drive for six months – a harsh consequence because of the life-threatening possibility of impaired driving. Teen overheard Guy and I discussing driving rules and knows that the discussion with him, and the signing of the contract, will be forthcoming. I’m glad, as he knows that we’re taking this seriously. We’re on the same page – literally, as we have a page that we will all sign together and then post in his room. The sad reality is that parents will need to stand together to expect that their kids will obey the law, because too many parents allow their kids to disregard the law. We live in a safe, small town and very likely our kids could drive their siblings and/or friends here to there and never get caught. I understand some parents have busier schedules and fuller lives and see the law as an imposition. But is that what we want to teach our kids: obey the law when convenient? At 16 years old, do we really expect them to discern when the law applies and when it might not? We plan to review the contract in three months, and three months after that, and again six months after that, which will take us to one year of teen driving. Meanwhile he’ll have to maintain good grades (insurance discount) and keep up his chores and generally be the nice kid he’s becoming in order to maintain driver’s privileges. And as with our cell phone rules, we expect that he will mess up. We will take away his keys. We will sit down and talk about it. We will start over again. We will always be learning. We are on his team. We are in this together.